Arthritis is a broad term for a number of conditions that cause joint damage to the body. One of the most common types of arthritis that involves your spine is osteoarthritis, or degenerative joint disease, and is very commonly seen by chiropractors. This is the most common joint disorder in the body, and can create an entire manifestation of symptoms including: joint pain and swelling, stiffness, locking, catching, muscle weakness, and limited movement. Although osteoarthritis can be very common, it is definitely NOT normal. Arthritis is a condition that only worsens the more you ignore it and refuse to treat it. Arthritis is caused by the body's reaction to an increase in joint pressure. This can be caused by a number of factors including: immobility, lack of exercise, or a misaligned joint especially in the spine. This causes stress of the joints, and forces them to support a greater responsibility than they are designed to. An example will be a person with a chronic misalignment of the spine, who does not receive treatment from a chiropractor. The spine is designed to have motion and flexibility at each one of the 24 movable joints of the spine. With misalignment, or subluxation, it creates a loss of motion at the individual joint. 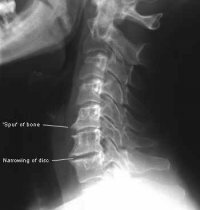 When this occurs, the spinal facet joints lose their natural ability to be shock absorbing. This creates a tremendous pressure on the joint, and the body's natural reaction to this pressure is to make the vertebrae become larger and stronger. However, as the spine is fully matured and is not increasing in size, it grows in the only other direction it can, which is towards the surrounding joints and soft tissues. These jagged outgrowths from the vertebrae are known as osteophytes, and eventually causes the bone and joint to degenerate. This is the process known as arthritis. Many people ignore their spinal problems for weeks, months, and even years. This is not healthy! Get checked out by a chiropractor. The symptoms caused by arthritis are your body's way of telling you that something in the body is not right. So what can you do? Well it just so happens that people every day have spine related problems that they have ignored for years. At Gallatin Valley Chiropractic in Bozeman, to relieve arthritis pain we first check to make sure each joint is moving correctly. Spinal misalignments can make the back and neck feel stiff, locked up, and painful. With chiropractic adjustments, we can restore the proper motion and relieve pressure from the joint and surrounding nerves. Next, we try and control the inflammation by a variety of techniques including therapies and proper diet and supplements. Lastly, we provide an exercise program and functional rehab to help keep bones in place and the joints functioning properly, preventing pain, stiffness, numbness and arthritis from occurring in the future.